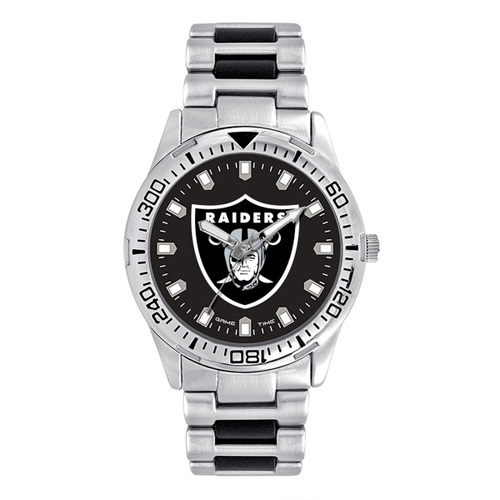 This men's Oakland Raiders Heavy Hitter watch has a silver-tone alloy bracelet and case. Mineral crystal. Round black dial with silver and white hour accents. Hour, minute and second hands. Stationary bezel. Japanese quartz movement. Water resistant to 99 feet. Withstands splashes of water, but watch cannot be worn while showering or be submerged. 42mm stainless steel case. Case thickness: 12mm. Band width: 20mm. Import.